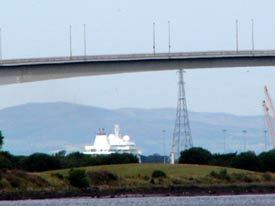 ABOVE: This telephoto shot of the Silver Whisper was taken from the banks of the River Foyle in downtown Londonderry, seven miles from Lisahally Pier. Londonderry, or Derry, was once a major port of embarkation for Irish emigrants to North America. The city is located on the River Foyle, more than an hour's cruise from the open sea and seven miles or 11 km from the Silver Whisper's berth at Lisahally Pier. Terminal facilities are minimal, but during our visit, the local authorities set up a canvas sun shelter with potted plants where passengers could wait for the hourly Silversea shuttle bus between the pier and central Derry's Guildhall. In the evening, Irish musicians and a children's dance group performed on board the ship.